This infrastructure project management software is used in 3 different levels of railway projects scope. TILOS is ideal for brownfield or greenfield railway construction. TILOS has special functionality used to plan a possession/occupation which typically includes more than one project/job. TILOS has a special set of features to make is easy to accurately plan and track an individual maintenance project/job. TILOS comes with a set of special railway building functions to support the daily work of the planners. These are mainly designed for track maintenance and repair projects, however for new rail projects you can use TILOS in its standard way and use also the functions for track laying and train configuration. The special railway functions are mainly designed to integrate the effect of complexities or hindrances such as crossings, switches or bridges directly into the schedule by dividing one task into many subtasks. This enables straight forward planning to create a project with only a few hours duration. 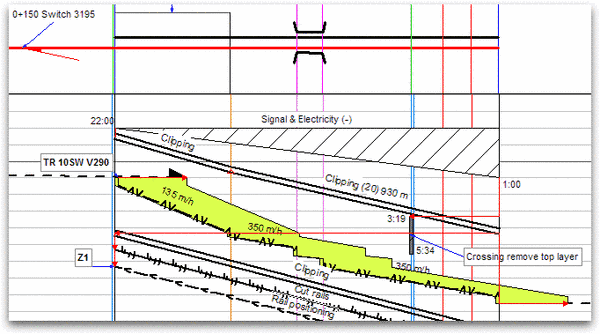 Ballast train calculation: TILOS calculates, for a given distance, how many railcars of a certain type are needed, or will calculate the distance that can be serviced by one train. For the track renewal trains TILOS calculates the number of sleepers needed and the number of railcars to carry them to site. Train setup time at beginning or at crossings is calculated by default. Different processes in sequence are kept on distance, so that one task does not cross the others. The usage of locomotives, trains and equipment can be displayed in a separate chart. Track renewal projects carried out during a night shift or on a possession weekend need an extremely detailed plan to make sure that on Monday morning at the trains can run as usual. Especially for these short time projects, TILOS provides an extremely automated method of planning by evaluating all distance based constraints that might affect the working speed. Several projects within a single possession or occupation can be carefully co-ordinated. Often there is a very limited time window and various works at non-contiguous locations within the possession. Often the focus maybe more on train movements within the possession than the details of the individual projects. TILOS provides specific functionality to assist the careful planning in this area. Because it is quick, easy and accurate, the planner is able to show different scenarios and also predict the likelihood of completing on time as the project varies from the original plan. TILOS was used by the Bombela consortium for the Gau train express that links Johannesburg, Sandton, Tshane and Johannesburg Airport. This rail project was built for the World Soccer Championship to transport soccer fans to the matches. More information about the project can be found under http://www.gautrain.co.za/construction. TILOS was used in the first stage for preparing the schedule for the tender. The challenge for the design as a linear project was that the project was divided into various sections, each having its own station numbering system from the past. TILOS solved this problem based on its flexible cell system by displaying each section in an individual cell with its own start and end coordinates. 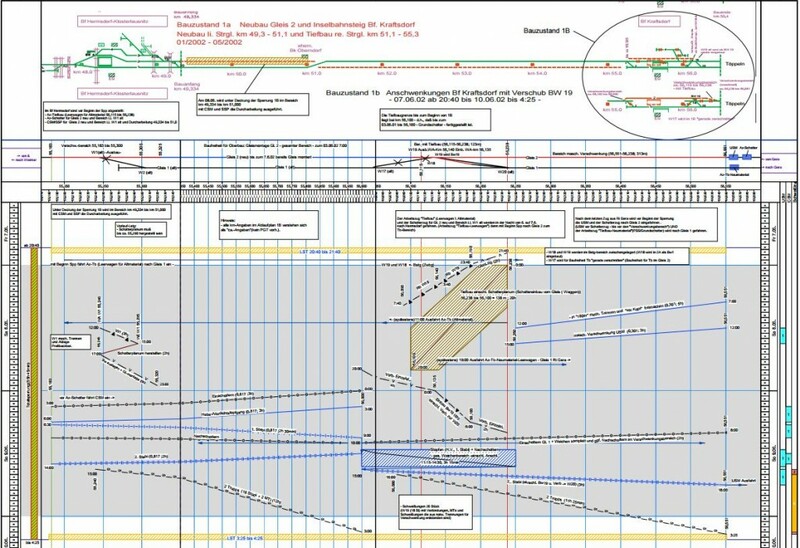 Later in the project execution phase TILOS was used in combination with Primavera (the general planning tool). The original plan done was subsequently updated from the master system to show the progress in the time distance view. 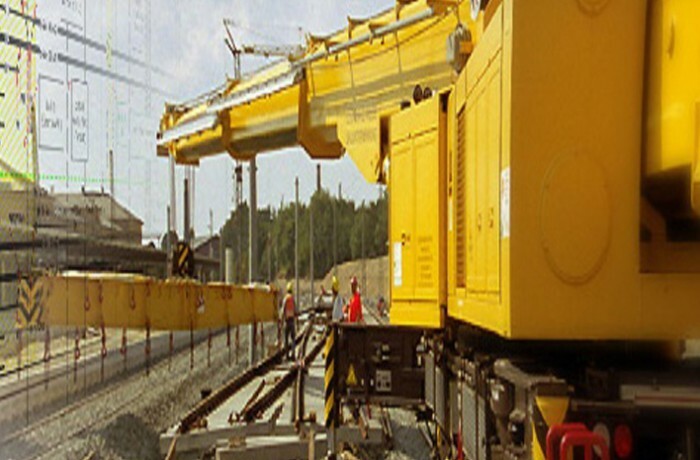 Delta Solutions recognises that every railway company and every railway project has unique needs. We look forward to discussing your requirements.